Commonly Asked - Why Did I Come To China? Commonly Asked – Why Did I Come To China? 1 – Wanted to get out of the day job – at Deutsche Bank, I felt it would take a few more years at the current position to move up organically, sure i had job offers and opportunities. I interviewed for internet marketing positions, and had offers from electronics retailer J&R in manhattan ny. I also was considering living down in florida near my family – i interviewed there for a marketing position (i wanted to get out of banking), and they offered me there too. But i realized both of these 2 positions were considerable decreases in salary…..sure, sure they say you shouldnt take a job based on salary…well….i couldnt accept that. I was also considering investing in opening a franchise – i got in touch with a franchise broker…went through the interview to identify the best franchise opportunity….they were some strange ones…like computer repair services, design service, etc. I told the broker “why would i pay these franchise fees for some no name brands when i could spend less money and open my own independent location under my own name.” he didnt like that question so much, didnt have a good answer for me, and didnt really expect much from me after that, and I felt opening a franchise operation wasn’t for me. 2- MBA not for me – I was considering an MBA, and had actually saved up most of my money to get that MBA. I was taking prep classes at night while at Deutsche, and remember clearly the first day going around the room “please state your name, where you work, and what you want to do with your MBA”, everyone else also had a job at a corporate bank in NY, BUT EVERYONE JUST WANTED TO GET A HIGHER PAYING JOB IN CORPORATE AMERICA after graduating from MBA school. When it got to my turn to answer, I said I wanted to get an MBA to learn how to start a business and network with entrepreneurs. I got some strange eyeballs, and realized quickly that an MBA was not the best investment for me to start my own company. Taking 2 years of my time, as well as tons of my savings ….seemed better to invest in opening a company. 3- New York Bar Store owners blocked me buying more shares. My friends didn’t want me to take majority of the company, I was asking to invest more money into the company, as well as work full time (we all day jobs at the time). Seems the others were afraid of losing power, and I can’t remember clearly the long email threads back and forth, but my idea was shot down. …..thinking…..what is something that has big opportunity, and if I could rank on the top of google for, I would make tons of cash. IMPORT / EXPORT! Bam! That was it. So I searched online for sources in china, so I could be an agent for them, use my internet marketing skills, get inquiries, make some deals happen, and get a check in the mail for the rest of my life. Easy, right! Found a company “Mainland China Trading” and they offered an agents program. quickly I signed up, and started studying more. Now, I didn’t move to China right away…..another factor WAS MY NEW YORK APARTMENT LEASE was running out in a month or two, the end of April. So Andrew, my roommate, and I had to let them know if we were staying or not. Whenever an apartment lease contract comes due, it makes me think! IS THIS WHERE I WANT TO CONTINUE SPENDING MY TIME. On top of that, I had a phone conversation with Piotr (common commenter here on the blog), and he had been living out in San Diego for some time. He mentioned he had an extra room….and he was a couple blocks from the beach…..had a really cheap rent on it, and no contract, just pay him personally. a) End of Year Review with Deutsche – NOT CHALLENGED. b) Considered Other Jobs, or a franchise – NO….thanks. d) Whats a BIG MARKET & needs internet marketing – IMPORT/ EXPORT from China! g) couldn’t buy majority of my current online business – so start my own consulting company to buy from China. So, was I another OPPORTUNIST. Its almost like a bad word here in the expat community in China. An opportunist is seen as someone without a clear objective, comes to China, tries different projects, burns cash, and ends of failing, getting a job, or going back to USA soon. Sure, I am an opportunist – I felt like its the 1800’s in USA, the gold rush of california. Have to get on the ground to see whats happening. If you read back on this exact blog, you’ll see my time in California. It was pretty cool, but I needed to be in the action. I was frustrated trying to remotely contact factories in China….and took a 1 month trip to see trade fairs, visit factories, and meet different business people. IT WAS INTENSE. I am an adrenaline junkie, I love adventure. I wanted to try to make things better, more streamlined, clearer, and easier for westerners to do business. haha, you can read along in this blog to see some speedbumps I hit there. I learned you cannot CHANGE CHINA. You have to adapt to learn how to do business the way it has been done forever, there is a fixed mindset, a culture, a way to do things. It is this way, and they aren’t going to let some foreigner come in and tell them how to they should be doing it. Do I regret quitting the day job and losing that income, as well as investing the money I have? – HELL NO. I got what I was asking for. And this is money damn well spent. Better then some MBA school, that I could put on my resume. This is blood, sweat, and tears. Sweat equity. And no one can take that from me. I am on the right track, sure its been difficult….and I have to admit, harder then I thought. But I am on track. INTERNATIONAL ECOMMERCE – mixing import export with the internet. That is where I am positioned, and I am right in the center of it. thanks Lammy, always supporting comments…. Mike it was interesting to learn your story. I think you definitely made the right decision not pursuing the MBA and having the courage to pursue your own path. Yes, You are absolutely right that that is the main question for everyone. But, I like your all details regarding the use of well known franchise. I still don’t know why I moved to China…and when I moved back to the US, I didn’t know why I left. I am really tempted to drop everything and go to China/Hong Kong to open my trading co.
many people talk to me about moving to China…. i think its similar to starting a business….there will never be a perfect time and you just gotta take a chance sometimes…. 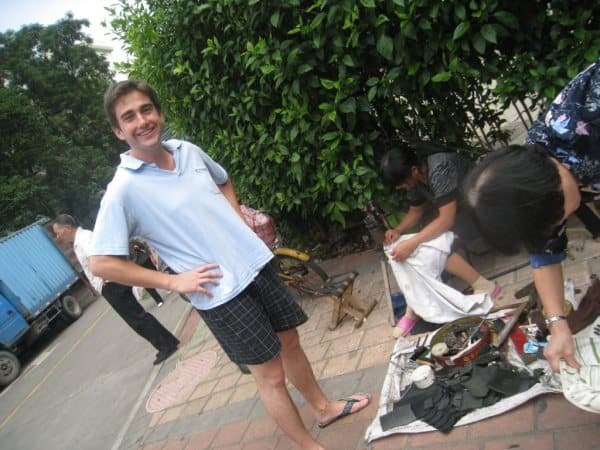 thanks for the comment Marcel, yes I am keeping up with the dream man – would be great to catch you in China one day! Good story Michael 🙂 China is indeed a beautiful country, and we are lucky to be here. Closed for so many hundreds of years to outsiders, the opportunities are here for those with the skill and persistance to grasp them. Do agree. If people want to get somewhere in “real” China, and not “only” in international-business&foreign-companies-China, they need to speak Chinese. How is your Chinese now? thanks for reading. I think in any country where you want to sell and integrate with the people there language is a good first step. I can have basic conversation with Chinese people but not business talk…. sigh. Yet my excuse is I never knew how long I would stay in China. but it seemsI keep extending my stay! cool welcome to join the chaos in China! I always suggest at the beginning to rent a room or do a short term lease so that you can try diferent options quickly. ditto to not getting a long term lease. In the last 6months, I’ve lived in hotels provided by employers and would even suggest getting monthly cheap hotel rentals, so you dont have to worry about internet, laundry, etc. you can concentrate fully on work and networking. I don’t have much GZ experience but networking and being around entrepreneurial peeps definitely happens in Shenzhen. I’ll be back there again this week, maybe for a month of client work and looking forward to it! thanks for reaching out! Sure learning Chinese is a good first step. for some reason i thought first to build my business to be stable and then learn chinese. for some reason my business in china still isnt stable haha! a lot of Chinese want to move to USA becouse of living, and a lot of American want to move to Chinese becouse of biz..interesting.. When I search “shenzhen entrepreneur” in Baidu, and find your nice blog in Chinese. Later trace it here, :). I am in HongKong now and back to shenzhen next month to start my own business. hope to see you there.